Are you planning to use decorative concrete on your driveway or patio but you are also having second thoughts because of the not too good things you have heard about it? Let us debunk these myths to help you make a final decision on this matter. Stamped concrete has an attribute that adds to its appeal and that is the fact that it is shiny. Due to this specific characteristic, many people presume that installing one can make the area slippery. While decorative concrete is slick, it is not slippery at all. The truth is you can add varying textures to the concrete to achieve an anti-slip surface. It is important to lay the concrete properly over the patios to get rid of the overly slick impression. Yes, it will crack especially when misused but it does not mean that it will crack the same way a regular concrete surface does. Whether the decorative concrete is stained or stamped, cracking will only happen if the concrete has not been mixed and poured properly over the surface. Add to that, weather can also affect this aspect. It is important to ask experts to do the pouring and stamping of your decorative concrete. This statement can be true if you did not hire experts to do the job. If you try to rethink the patios you have walked on where decorative concrete has been used, we are pretty sure there are many patios out there that made you feel you are walking on natural stone. This makes decorative concrete indiscernible when placed closely to natural stone. Stains are made over decorative concrete and these ones are not like paint that can chip later on. Due to acid staining, the concrete will be able to avoid chipping. In case chipping occurs in the future, you can always blame the sealant. This can be repaired easily and should not cause a lot of problem especially on the aesthetic aspect of the material. As mentioned awhile back, a sealant is used to preserve decorative concrete. This sealant protects the concrete from fading due to ultraviolet rays of the sun. This should not be a cause of concern at all and if it does fade, it will never happen in the near future. Decorative concrete remains to be a popular choice among many. It can be a choice for you too especially after debunking the most common myths connected to using one. It is a matter of choosing the decorative concrete you want laid on the outdoors and choosing an expert to help install this type of concrete in your home. Careful planning is also very important to prevent any of these things form happening. 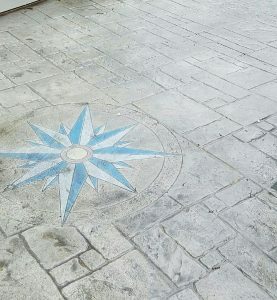 Now that everything is clear, you are perfectly ready for choosing the expert who specializes in stamped concrete patio in Philadelphia. Don’t hesitate to give us a call and will prove to you that indeed these myths are wrong!